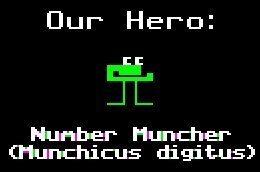 It kind of took me awhile to get going because while searching for images for this post, I discovered I can actually play Number Munchers online and got all excited and sidetracked. I haven’t played this game in over 15 years but it is still just as fabulous as always. And there are way more levels than Cedar Manor Elementary’s computers had. Just how wacky and wild is this scoring? FIRST OF ALL, in all of last year, tDogs scored 74 goals. This year through 16 games, tDogs have scored 51. That means they are 18.1 goals ahead of last year’s pace. SWEET. Last year’s total power play goals? 18. This year? 24. Yeah, I did a freaking double take at that number. Let’s look at how some of the guys are faring individually. >Ha, Number Munchers rocks. I have to remember to check that out once I get home. Takes me back to the day when you just pick up a video game and play, nice and simple. >Also…it’s only the geeks playing number munchers…all the cool kids were playing oregon trail on the Apple II computers with the green glowing screens! >That link to Number Munchers also has a link to Oregon Trail. Bethlyn, Jacky, Dirty, Kinner and I made it! >So many dorks … so little time.